Our son Donald is currently a patient at Akron Children’s. 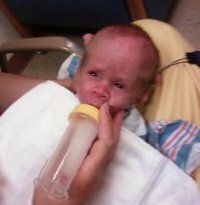 When he was just 11 days old, his belly ballooned up and he was throwing up all his feedings, he was transferred from Akron City, and from the moment he was being picked up by the transport team, to meeting Dr. McCullum, we knew my son was in good hands. He was fantastic. He broke down what he had into terms we could understand, told us what he felt would happen, but was also realistic, and told us my son may have to have surgery. Thank God, he didn’t have to have surgery as of now, he is back onto a feeding schedule, and has hopefully beaten the NEC (necrosis, or death, of parts of the intestine). My son is now 26 days old, and doing good. All the nurses have been great, teaching me hands on how to care for him, feed him, and change him. I’m so happy I have the nurses and drs and Children’s to hold our hands, otherwise I’m not sure where I would be right now, it is the scariest thing to have a little one in the NICU but with such wonderful workers it’s not sooo bad. Please Children’s, contact me, if I can help any parents out with my story, or if you would like to share my story. Hopefully my son will go home soon.